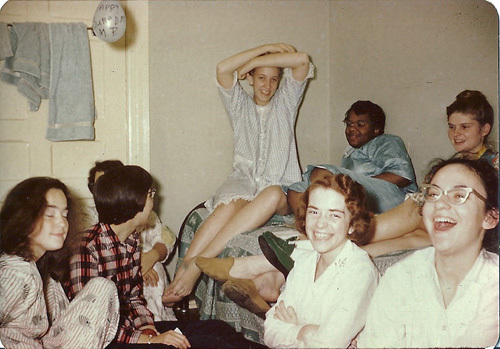 Some of the Sherkites at a surprise birthday party for Nicky Pannwitt (arms up hiding the curlers in her hair) on Nov. 14, 1959, in her room on the Parrish 4W hall. From left: Anya Bozeman, Nina DiAngelo, Barbara Daly (hidden behind Nina), Nicky Pannwitt, Barbara Ravenell, Marilyn Tindall, Marcella Arnow, and Susan Womer (behind Marcella). 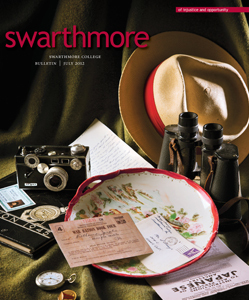 We freshmen in the Class of 1963 arrived at Swarthmore on a wave of euphoria born of freedom from parental control, the beauty of the campus, and the excitement of meeting talented peers from across the country. Quite soon, reality hit. All freshmen in those days had to take five full-credit courses. Each course, it seemed, required a staggering amount of work, especially the introductory courses in history and biology. Leo Braudy ’63 memorably complained, “Every time I learn a date, I forget a fish!” Midterms taught us humility, as valedictorians and National Merit Scholars saw Bs and Cs on papers and exams for the first time. History I students were scattered among small discussion groups. Harrison Wright, the youngest history professor, had multiple sections of Western Civilization, which began with ancient Egypt, Mesopotamia, India, and China. He quickly discerned our near-total ignorance of Asia, sent us to atlases and other sources, and had us drawing mental maps of the rivers of India. We liked him, especially his dry sense of humor, and we enjoyed learning about Asia, but the course rapidly moved into the traditional focus on Greece and Rome. By November, History I had covered thousands of years and reached the Protestant Reformation. Several freshmen women who lived on fourth-floor Parrish habitually studied in what was then the Math Library, a small room up a spiral staircase in the cupola. One dark November evening in 1959, we hatched a hoax. Recently, some of us and Professor Wright shared memories by email and reconstructed that long-ago conspiracy. Our thick Western Civilizations textbook had only a chapter on the Reformation, but every paragraph described one or more sects and their founders, theology, countries, and dates. Did Professor Wright, a specialist on New Zealand’s Maori, know all the reformation details that we were expected to memorize? Suppose we knew about a sect that wasn’t in the book. Would he admit there was something he didn’t know? Would any of his colleagues? Inspired to mount a tiny rebellion against the workload, we created our own sect. To our surprise and delight, none of our name-dropping provoked challenge or comment from our professor. Was he pretending to know about the Sherkites, or hadn’t he noticed our insertions? After the Thanksgiving break, we recruited volunteers from other dorms in sections taught by Professor Wright and by other professors. We coached our converts to insert Sherkites into their class discussions. Same result: Still no reaction from the professors. We developed a Sherkite theology so we could answer questions if challenged. Our Sherkites used the circle, rather than the cross, as a symbol of God’s universal love and connectedness. They greeted one other with a circular wave, saying, “May the Spirit be around you!” Frederick Sherk ordained his clergy by bathing their feet using rotating motions. And of course the Sherkite clergy rode circuits, preaching to their widespread followers. We began another “round” of inserting references to Sherkites into class discussions. Our plot thickened: We introduced a Sherkite scholar—E.R. Englehardt, actually a classmate’s uncle in California. We found another student’s relative, who lived nearby and had a flair for dramatics, to be Englehardt. We enlisted him to give a lecture on campus after the winter break. We sent an announcement to The Phoenix and posted flyers on bulletin boards advertising the lecture on Jan. 5 by a distinguished historian from McGill University in Canada (not easily verified, in those days before the Internet). Dr. Englehardt was the author of a forthcoming book, The Sherkites and Other Little Known Sects of the Reformation. We began to draft his speech—and plan his speedy exit at the end. When the next issue of The Phoenix appeared, we searched eagerly for our announcement. It wasn’t there. Clearly, someone was trying to outhoax us. We quickly found out who had leaked our secret, as the culprit lived on our hall and confessed. A junior had mentioned the Sherkites in the Renaissance and Reformation seminar taught by Peter Riesenberg. He pounced, and her knowledge of Sherkite theology was too thin to answer his questions. She caved and revealed all she knew. We quickly moved into damage control, taking the audacious step of calling Professor Riesenberg. We gathered by the rotary-dial phone on the wall in Parrish 4W hall. Identifying ourselves as Sherkites, we asked if E.R. Englehardt had left for Afghanistan yet. Claiming to be in direct touch with the man, he said Englehardt would not be returning to the United States for a very, very long time. We heard the humor in his voice and were sure he had written the letter to The Phoenix. He heard giggles at our end, asked how many of us were there, and then recited all our names. He then complained that we had wasted the time of history department professors who had tried to research the Sherkites. He also revealed that a faculty member in another department had asked about the Sherkites at a national conference during the Thanksgiving break. The other gift was a round piece of cardboard to Wright from the Sherkites (opposite page). The Sherkites also had a letter mailed from Afghanistan from the fictitious Englehardt to “Father” Wright. Our recent email exchanges revived a relationship that has remained warm since that evening on Crum Ledge. We aging Sherkites remain grateful for Professor Wright’s teaching in that first rough semester. In departing from the main thrust of the History I course to introduce us to non-European areas—and later creating the first course in African history at Swarthmore—he inspired several of the charter members of the Sherkite “faith” with a lifelong interest in developing countries. Barbara Daly Metcalf ’63 became a history professor, specializing in Islamic movements in Pakistan. She recently completed her term as president of the American Historical Association. Barbara Ravenell Joshi ’63, now the widow of an Indian scientist, became a specialist in change among India’s Dalits (“Untouchables”), and divided her career between academia and human rights organizations. Monica “Nicky” Pannwitt Bradsher ’63 went to India as a Fulbright fellow, married an American foreign correspondent there, and was the educational media editor for the National Geographic Society. Marilyn Tindall Glater ’63, recently retired as a dean and professor of law at Tufts University, is an expert in African common law.